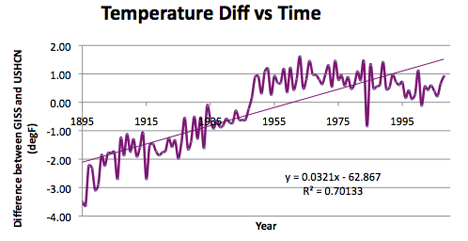 This is one of an evolving series in which I am looking at the temperatures over the past 115 years in the different states of America. I started in Missouri, and have gradually changed the format of the post as I have found different things in my exploration of the data. 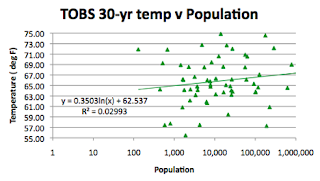 Last week in looking at Oklahoma I changed the plot which compares the population around the measuring station to compare it with only the average of the last 30-years of temperature data, rather than the entire 115 years. This does not mean that the last 115 years of data is not valuable, though once I started collecting the GISS records for the state, I found that longer term range does not appear to concern them as much. 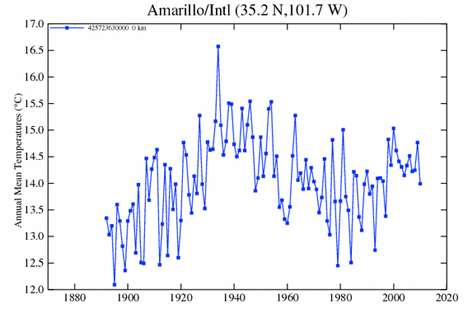 Of the thirteen GISS stations listed for Texas, there are only three with a temperature record over the full 115 years. The remaining ten stations only have records since 1948. There are 49 USHCN stations in Texas, ranging from Albany to Weatherford, and they are spread not quite evenly over the state. 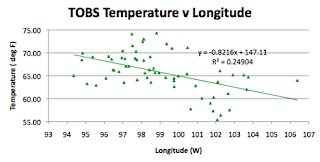 Looking for the GISS station record for Austin I found that there are 3 different records in the GISS file the longest one, however, (1895 to 2009) is for an Austin at a different set of co-ordinates (39.5 N, 117.1 W) to the city which is the logical choice. 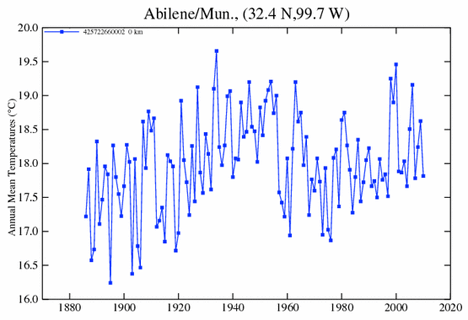 Of course the currently used site (Austin/Robert 30.3 N 97.7 W) only has data from 1948, but then, so do the others I mentioned. 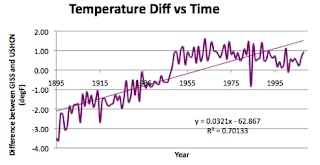 Houston, for example, has four stations, but the one that GISS has chosen to keep maintaining records for has only been around since 1948. 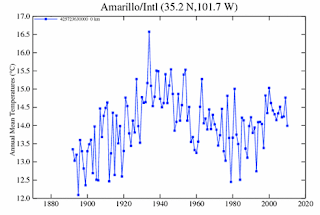 While it may be that I am more cynical than most it should be noted that, if one looks at the record for, for example, the GISS stations in Abilene and Amarillo, there are very clear higher temperature spikes in 1933 and 1934, above the most recent high temperatures. 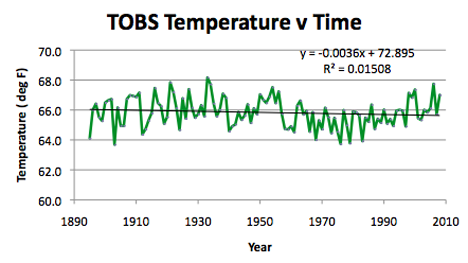 However if one only plots the temperatures since 1948 (as most GISS stations do) then there is no evidence that the temperatures were, in that record, higher than the recent past. 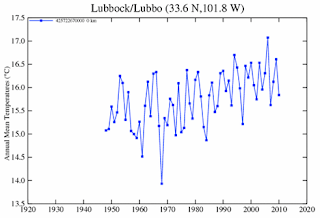 For example consider the case of Lubbock as an example. Looking at the overall temperature differences between the GISS temperature average, and that of the homogenized USHCN temperatures, there is a clear trend, although heavily influenced by the changing number of stations in 1948. Difference between the average GISS station temperature and that of the homogenized data from the USHCN stations. For Texas as a whole, of the average of the temperatures measured, adjusted for time of observation only (the TOBS temperatures) are used, then the state temperature appears to have declined slightly over the past 115 years. Average temperature in Texas from 1895. 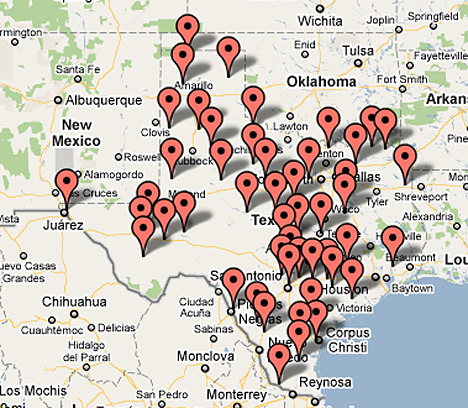 Texas is 790 miles long and 660 miles wide, including the bit that sticks up almost to Kansas and down past parts of Mexico. 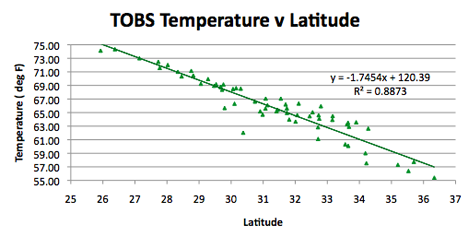 Thus it extends from 93.5 deg W to 106.5 deg W, and from 25.2 degrees N to 36.5 degrees N. is the second largest state, behind only Alaska in size. The mean elevation of the state is 518 m, and it runs from sea-level up to 2,666 m (Guadalupe Park). 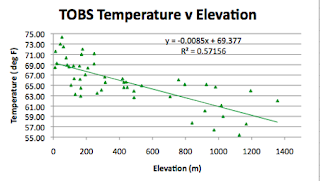 The average USHCN station is at a height of 438 m, while the average GISS station is at a height of 375.9 m. The Center of the state by latitude is sensibly at 31.25 degrees N. (both GISS and USHCN stations center on 31.3 degrees). 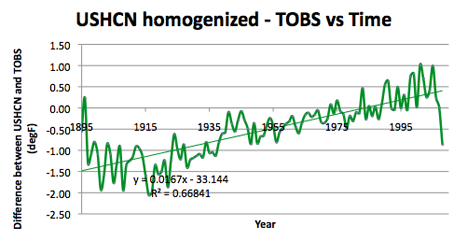 Difference between the reported USHCN homogenized data for Texas and the raw data corrected for time of observation (TOBS). Sorry this is a little rushed today but a little excitement in the hotel with a fire alarm bringing us all down to the lobby and slowing things related to leaving. Nothing relative to the disasters of the rest of the world, but taking time.